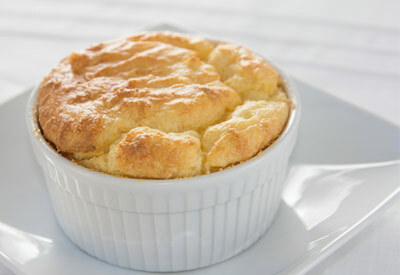 Butter a 2-quart souffle dish with 2 teaspoons butter. Sprinkle sides and bottom of dish with 1 tablespoon of Parmesan cheese. Place potatoes in a steamer insert over simmering water. Cover with lid and steam for 10 minutes. Add cauliflower and cover with lid. Steam an additional 20 minutes or until potatoes and cauliflower pieces are tender. Remove from heat and transfer to a large bowl. Using a potato masher or ricer, mash potatoes and cauliflower until smooth. Cut 1/4 cup of butter into pieces. Add butter, Gouda cheese, Gruyere cheese and 1/4 cup Parmesan cheese to warm potato mixture stirring just until melted. To half and half, whisk in egg yolks, salt, paprika, and cayenne pepper. Stir into potato mixture. If a smoother mixture is desired, use electric mixer to beat until smooth. In a medium bowl, beat egg whites and cream of tartar until stiff peaks form. Fold egg whites into the potato mixture. Spoon mixture into prepared soufflé dish. Bake 45 to 50 minutes or until center of soufflé is just set. Remove from oven and serve immediately.